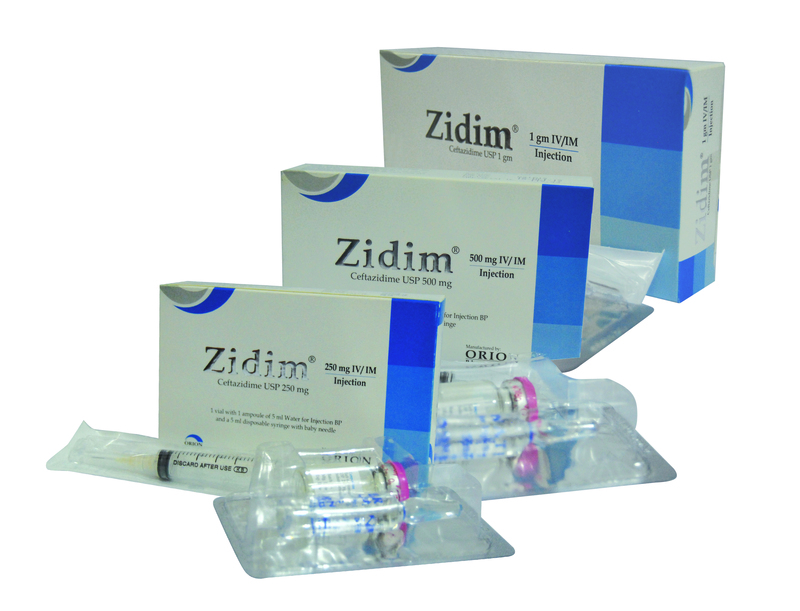 Zidim (Ceftazidime) 250 mg IV/IM injection: Each vial contains Ceftazidime USP 250 mg, buffered with Sodium Carbonate. Zidim (Ceftazidime) 500 mg IV/IM injection: Each vial contains Ceftazidime USP 500 mg, buffered with Sodium Carbonate. Zidim (Ceftazidime) 1 gm IV/IM injection: Each vial contains Ceftazidime USP 1 gm, buffered with Sodium Carbonate. Single infection, Mixed infections, Severe infections in general, Respiratory tract infections, Ear, nose and throat infections, Skin and soft tissue infections, Gastrointestinal, biliary and abdominal infections, Bone and joint infections, Dialysis: Infections associated with haemo- and peritoneal dialysis and with continuous ambulatory peritoneal dialysis (CAPD). Ceftazidime is contra-indicated in patients with known hypersensitivity to Cephalosporin antibiotics. Ceftazidime is to be used by the parenteral route, the dosage depending upon the severity, sensitivity & type of infections and the age, weight & renal function of the patient. Adults: The adult dosage range for Ceftazidime is 1 to 6 gm per day 8 or 12 hourly (IV/IM) in the majority of infections, 1 gm 8 hourly or 2 gm 12 hourly should be given. In urinary tract infections and many less serious infections, 500 mg or 1 gm 12 hourly is usually administered. When used as a prophylactic agent in prostatic surgery, 1 gm should be given at the induction of anesthesia. A second dose should be considered at the time of catheter removal. Cystic fibrosis: In fibrocystic adults with normal renal function who have pseudomonal lung infections, high doses of 100 to 150 mg/kg/day as three divided doses should be used. In adults with normal renal function 9 gm/day has been used safely. Infants and children: The usual dosage range for children aged over two months is 30 to 100 mg/kg/day, given as two or three divided doses. Doses up to 150 mg/kg/day (maximum 6 gm daily) in three divided doses may be given to infected immunocompromised or fibrocystic children or children with meningitis. Neonates and children up to 2 months of age: The usual dosage range is 25 to 60 mg/kg/day as two divided doses. Clinical trial experience has shown that Ceftazidime is generally well tolerated. Adverse reactions are infrequent and include: Local: Phlebitis or thrombophlebitis with i.v. 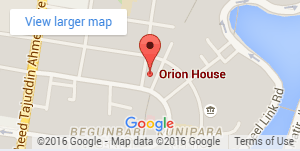 administration; pain and/or inflammation after i.m. injection. Hypersensitivity: Urticarial rash, fever, pruritus and very rarely angioedema and anaphylaxis (bronchospasm and/or hypotension). Gastrointestinal: Diarrhoea, nausea, vomiting, abdominal pain and very rarely oral thrush or colitis. Other adverse events which may be related to Ceftazidime therapy or of uncertain aetiology include: Genito-urinary: Candidiasis, vaginitis. Central nervous system: Headache, dizziness, paraesthesia and bad taste. There is no experimental evidence of embryopathic or teratogenic effects. Clinical experience with Ceftazidime has shown that this is not likely to be a problem at the recommended dose levels. There is no evidence that Ceftazidime adversely affects renal function at normal therapeutic doses. There is no experimental evidence of embryopathic or teratogenic effects attributable to Ceftazidime, but with all drugs it should be administered with caution during the early month of pregnancy and early infancy. Increased nephrotoxicity has been reported following concomitant administration of Cephalosporins and Aminoglycoside antibiotics. Zidim (Ceftazidime) is supplied as a sterile powder in glass vials. Zidim (Ceftazidime) 250 mg IV/IM injection: Pack of 1 vial contains Ceftazidime USP 250 mg, buffered with Sodium Carbonate accompanied by a solvent ampoule of 5 ml water for injection BP & a 5 ml disposable syringe with a baby needle. Zidim (Ceftazidime) 500 mg IV/IM injection: Pack of 1 vial contains Ceftazidime USP 500 mg, buffered with Sodium Carbonate accompanied by a solvent ampoule of 5 ml water for injection BP & a 5 ml disposable syringe. Zidim (Ceftazidime) 1 gm IV/IM injection: Pack of 1 vial contains Ceftazidime USP 1 gm, buffered with Sodium Carbonate accompanied by a solvent ampoule of 10 ml water for injection BP & a 10 ml disposable syringe.